Last Wednesday, Manchester City fell victim to a first-half onslaught by one of the deadliest counter-attacking teams in world football: Jürgen Klopp’s Liverpool. I will use pictures to explain exactly how both teams set up in the first half and how these tactical setups led to three Reds goals in under twenty minutes. Liverpool’s midfield was key in both defensive and attacking transitions. This is especially true when defending in a low-block; the compactness and awareness of Milner, Henderson, and Oxlade-Chamberlain restricted the space City had when entering the Liverpool’s defending half. 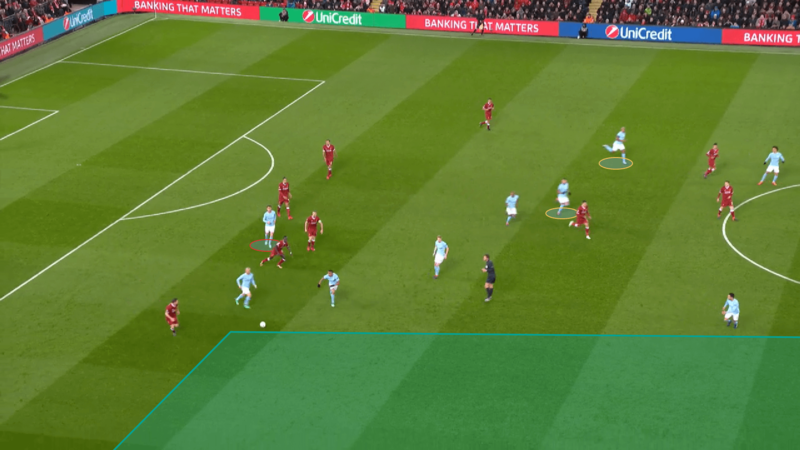 Liverpool’s deep block restricted the space in which Manchester City could play between the first and second defensive lines. This forced players like Fernandinho to recycle possession back to defenders or out wide. Above, Fernandinho is in possession in the right half-space. Every other midfielder is sufficiently guarded by Liverpool – Firmino and Henderson are suffocating De Bruyne’s freedom, Milner and Mané are cover-shadowing Gundogan, and Oxlade-Chamberlain is positioned to cover a wide pass to Silva. Even with Walker positioned in space, there was no outlet in the form of Raheem Sterling to advance the ball down the wing. With central defender Aymeric Laporte starting at left-back and playmaker Ilkay Gundogan replacing Sterling on the wing, there were very few wide options for Guardiola’s City. Kyle Walker and Leroy Sané offered some impotence going forward, but the former was too often pinned back by Liverpool’s pressing. We see above how Andrew Robertson’s pressing in tandem with Sadio Mané formed a trap on Walker. With Gundogan tucking inside, Robertson doesn’t need to bother marking a winger on his flank, allowing the Scotsman to effectively double-team Walker on the touchline. Manchester City’s double-pivot of Fernandinho and Kevin De Bruyne provided outlets to pass around Firmino, but failed to offer a passing option with the ball out wide. 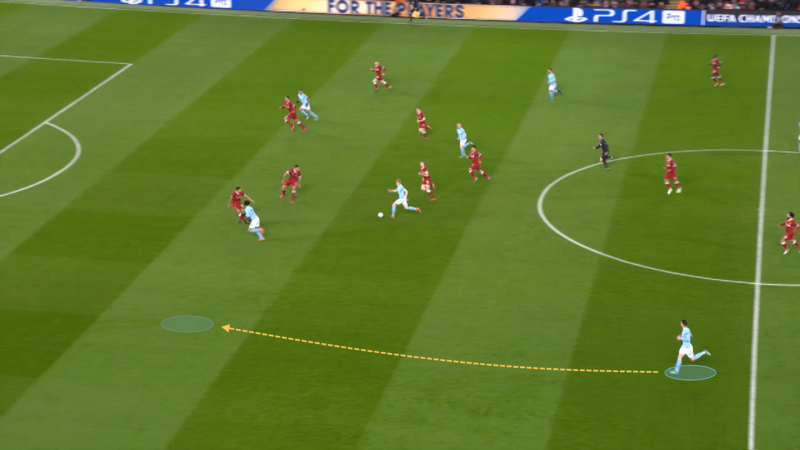 Liverpool players like Andrew Robertson exploited this by pressing the ball in wide areas, forcing City to either clear the ball or pass around the back. When Liverpool pressed high, it was obviously a bit easier for City to find space between the Reds’ lines. The right side of the pitch was often used as a catalyst to move the ball forward, mostly because of Aymeric Laporte’s lack of an attacking mentality. Walker was often used as bait or as a ball-carrier in the first half, but Liverpool did an excellent job of cutting out his playmaking. Jürgen Klopp set up his midfield in an extremely effective fashion, both when pressing high and settling into a low block. As you can see, James Milner man-marked Gundogan when the German operated as a number 10 opposite David Silva. Walker is under a lot of pressure to make a pass in this scenario and Milner does a great job of marking Gundogan to prevent an easy opening. To make matters worse for City, the midfield pivot (circled in yellow) of Fernandinho and Kevin De Bruyne was too deep to present a good passing option. Mané’s position makes a pass to the deep-lying midfielders nearly impossible, so Walker is left with nothing to do but pass long or risk losing possession. Sadio Mané and James Milner’s defensive coverage was another way Liverpool stopped Manchester City from building out of the back effectively. However, it also left the middle of the pitch exposed for extended periods of time. City found space in the buildup phase when their defenders were spaced out. Usually, Guardiola’s side use only one defensive midfielder (Fernandinho) between the defenders, but against Liverpool it was De Bruyne who joined the Brazilian in the double-pivot. It’s easy to see in the above photo that Liverpool focused on reducing passing lanes in the half-space. This is represented by Mané’s cover-shadowing of Walker and Gundogan, as well as Milner taking up space. De Bruyne’s deeper positioning opened up lots of space between Liverpool’s first and second lines of defence. City’s issue on the night wasn’t their spacing, for the most part, but instead how they executed as a team. Also, Firmino’s positioning is partially blocking a lane to the Belgian midfielder. If Otamendi had looked up sooner, he would’ve been able to make a simple pass. Instead, City too often held onto possession, which allowed Firmino to reject the simple pass. This resulted in the Citizens rotating the ball around the back for large periods of time, unable to penetrate effectively. The issue for Manchester City – for one play, at least – became having too much space to work the ball around in. Nicolas Otamendi dribbled into space during a play not dissimilar to the above example, but he lost possession, leading to a quick Liverpool counter. Salah recovered his deflected shot, crossed into the box, and Mané headed in the home side’s third goal to finish off a perfect opening 30 minutes. 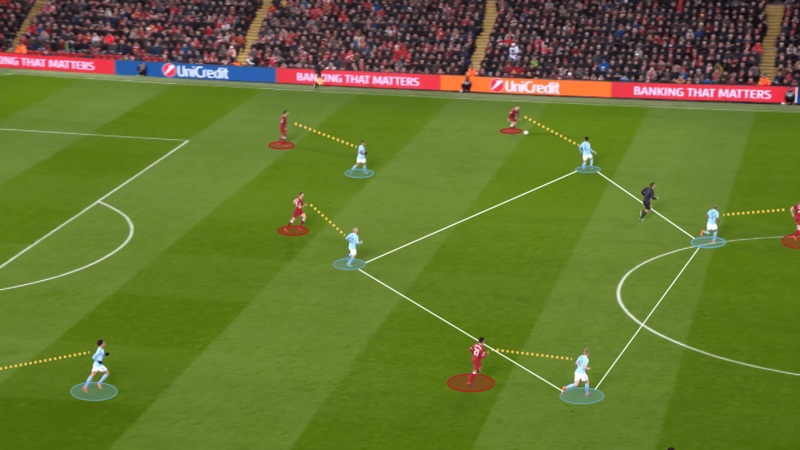 With Liverpool caught between two phases — pressing high and sitting compactly — Manchester City were sometimes able to find space between Liverpool’s first and second lines of defense. However, as Leroy Sané was City’s only wide attacker, Fernandinho only had one long passing option. When access to the deep midfield was granted, Liverpool often struggled to impose tight marking on City’s players. In the above shot, Fernandinho received the ball from Vincent Kompany’s short pass. Even though it was an unguarded pass, the Brazilian wasn’t met with a defender ahead of him. Milner sat deep with his fellow midfielders, which gave Fernandinho time to think and space to execute a long pass. With Oxlade-Chamberlain worried about cover-shadowing Silva, only Alexander-Arnold could challenge a wide pass to Sané. At left-back, Aymeric Laporte failed to get forward when required. In this counter-attack, De Bruyne would have found a wide option extremely helpful to push play forward. Instead, the play came to nothing with only Sané offering a line-breaking run. When Liverpool’s high press failed, City were able to find space on the counter-attack at times. This phase also exposed their lack of wide threat, as Sané didn’t have much support in running behind the lines. Laporte is clearly lagging behind the play in a scenario that could use his wide presence. With only the German winger to cover, Trent Alexander-Arnold put in a magnificent defensive shift on the night. City struggled to break down Liverpool to a great extent, with Leroy Sané’s dazzling run the only major chance of the opening 10 minutes. The Premier League leaders committed men forward for a corner routine (see Otamendi and Kompany in yellow, Laporte in orange), but a miscued pass by the young German winger sent Liverpool off down the right flank. As seen below, James Milner had acres of space to make an accurate pass to Mohamed Salah to ignite the fiery Klopp counter-attack that’s been threatening defences for years. Liverpool’s first goal was created after an errant Manchester City pass. Since the play was post-corner routine, City had both center-backs and left-back Aymeric Laporte committed forward. James Milner found loads of space on the right flank, easily passing through to Mohamed Salah to begin the attack. A failed clearance from Kyle Walker following an Ederson save allowed the Brazilian false-nine to poke the ball away, leaving Salah with an easy chance in front of goal. City dominated the ball in the first twelve minutes, but all it took was a mistake and quick attack by the Reds to concede the first of the night. This isn’t to say that Liverpool played poorly before the goal; Jürgen Klopp clearly set out to constrict space and let City keep the ball. His plan paid massive dividends when Milner was given the authorisation of space to unleash the speedy Egyptian on the counter. Many of Liverpool’s opportunities weren’t a result of keeping possession, but instead those due to high pressure. Their first spell of possession after scoring was Andrew Robertson booting the ball towards City’s backline, even though he had space to roam forward. Why give away possession so easily? Klopp’s team thrives when gegenpressing (counter-pressing), so Firmino and Mané both immediately press Otamendi, who is forced to clear the ball under pressure. Mané intercepts the errant pass and the Argentine defender was forced to foul the Senegalese winger. Liverpool weren’t completely reliant on counter-attacking chances. Manchester City set up in a man-marking defensive press for much of the first half when the home side were in possession. As seen below, David Silva pressed up on a deeper Jordan Henderson while Gundogan and De Bruyne pressed wider-positioned players. James Milner (right of picture) drew Fernandinho forward, meaning that a large space in the middle of the pitch opened up. An incisive run from Henderson or Oxlade-Chamberlain could have spelled trouble for the Sky Blues, which is something to look out for if City press high in the second leg. Liverpool did find some success when keeping possession. Manchester City inflicted a man-marking press, but often left the center of the pitch exposed. Oxlade-Chamberlain’s goal was a product of a failed man-marking task by De Bruyne. Liverpool’s second goal – a long shot from Oxlade-Chamberlain – was largely the result of a failed man-marking scenario. Sadio Mané found space on the left and passed to Firmino between City’s defence and midfield line. Kevin De Bruyne (pictured above marking Ox) collapsed on Firmino, leaving the former Arsenal man open in the centre of the park. City were arguably the better side in the second half of the match, especially after substituting Ilkay Gundogan for Sterling. However, the Reds managed to defend successfully and go into the second leg on Tuesday with a major advantage. Liverpool’s compactness in their defensive half combined extremely well with a quick, high press. City looked flustered throughout much of the match, which is exactly what Klopp wants to see. Andrew Robertson’s physicality and intelligence when pressing forced Gundogan to retreat into a more central position more often than not, while the midfield three severely disabled City’s ability to play through the lines. If Jürgen Klopp wants to avoid embarrassment at the Etihad, very little should change in terms of defensive structure. Obviously, a more reserved attacking approach should go without saying, but it’s the fiery pressing and mentally diligent defending that caused so much trouble for Guardiola’s men, not Liverpool’s fine attacking display. For City, Pep understands that it will take a minor miracle to see the Premier League leaders advance to the Champions League Semi-Finals. Down three goals with no away goals to fall back upon, there is a requirement that no goals are allowed on Tuesday. Not only should there be a personnel change (Sterling for Gundogan, Delph for Laporte), but a mentality change as well. City struggled to enforce an effective press for sustained periods because Liverpool would simply boot the ball long when under pressure. If Klopp decides to retain more possession, the likes of Sterling, Jesus/Agüero, and Sané can run at the backline with speed and organisation. It would also be wise to position De Bruyne higher up the pitch as opposed to one part of a double-pivot with Fernandinho. This will give wide players more options to release a pass to the middle of the pitch. As much as I hate to say it, Manchester City did not play especially poor in terms of tactics. They retained possession fairly well, found chances for the lone winger in Sané, and restricted Liverpool from penetrating too often with their world-class winger duo. It was a failed clearance, marking error, and failure to close down a wide player that cost them three concessions. However, this is exactly how Liverpool want to win games. It doesn’t matter to Klopp if his team controls the ball in the way we think of “controlling” it, as long as they control it in certain areas of the pitch (in the box). Both sides played how they have for over a year, and we shouldn’t expect them to modify their approaches to an extreme extent on Tuesday, even with a 3-0 aggregate score.